Erie ( /ˈɪəri/; EER-ee) is a city on the south shore of Lake Erie and the county seat of Erie County, Pennsylvania, United States. Named for the lake and the Native American Erie people who lived in the area until the mid-17th century, Erie is the fourth-largest city in Pennsylvania, as well as the largest city in Northwestern Pennsylvania,  with a population of 101,786 at the 2010 census. The estimated population in 2017 had decreased to 97,369. The Erie metropolitan area, equivalent to all of Erie County, consists of 276,207 residents. 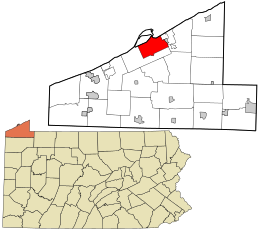 The Erie-Meadville, PA Combined Statistical Area has a population of 369,331, as of the 2010 Census. 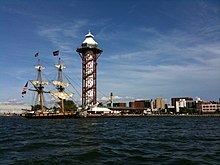 Erie is known as the "Flagship City" because of its status as the home port of Oliver Hazard Perry's flagship Niagara. The city has also been called the "Gem City" because of the sparkling lake. Erie won the All-America City Award in 1972, and in 2012 hosted the Perry 200,  a commemoration, celebrating 200 years of peace between England, America and Canada following the War of 1812 and Battle of Lake Erie. Cultures of indigenous peoples occupied the shoreline and bluffs in this area for thousands of years, taking advantage of the rich resources. The Sommerheim Park Archaeological District in Millcreek Township, Pennsylvania west of the city, includes artifacts from the Archaic period in the Americas, as well as from the Early and Middle Woodland Period, roughly a span from 8,000 BCE to 500 CE . The General Assembly of Pennsylvania commissioned the surveying of land near Presque Isle through an act passed on April 18, 1795. Andrew Ellicott, who completed Pierre Charles L'Enfant's survey of Washington, D.C. and helped resolve the boundary between Pennsylvania and New York, arrived to begin the survey and lay out the plan for the city in June 1795. Initial settlement of the area began that year. Lt. Colonel Seth Reed and his family moved to the Erie area from Geneva, New York; they were Yankees from Uxbridge, Massachusetts. They became the first European-American settlers of Erie, settling at what became known as "Presque Isle". On August 3, 1915, the Mill Creek (Lake Erie) flooded downtown Erie. A culvert, or a tunnel, was blocked by debris, and collapsed. A four-block reservoir, caused by torrential downpours, had formed behind it. The resulting deluge destroyed 225 houses and killed 36 people. 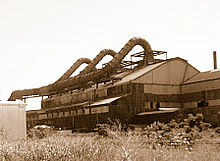 After the flood, Mayor Miles Brown Kitts had the Mill Creek directed into another larger culvert, constructed under more than 2 miles of city, before emptying into Presque Isle Bay on the city's lower east side. Erie is situated in northwestern Pennsylvania at 42°6′52″N 80°4′34″W﻿ / ﻿42.11444°N 80.07611°W﻿ / 42.11444; -80.07611 (42.114507, -80.076213),  on the southern shore of Lake Erie across from the Canadian province of Ontario. It is 100 miles (160 km) northeast of Cleveland, Ohio, 90 miles (140 km) southwest of Buffalo, New York, and 128 miles (206 km) north of Pittsburgh. Erie's bedrock is Devonian shale and siltstone, overlain by glacial tills and stratified drift. Stream drainage in the city flows northward into Lake Erie, then through Lake Ontario into the St. Lawrence River, and out to the Atlantic Ocean. South of Erie is a drainage divide, beyond which most of the streams in western Pennsylvania flow south into the Allegheny or Ohio rivers. Lake Erie is about 571 feet above sea level, while the city of Erie is about 728 feet above sea level. According to the United States Census Bureau, the city has a total area of 19.3 square miles (49.9 km2), with 19.1 square miles (49.4 km2) being land and the remaining 0.2 square miles (0.5 km2), or 1.03%, being water. 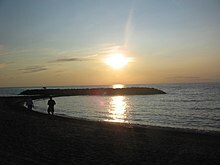 Presque Isle State Park (known to the locals as "The Peninsula"), juts into Lake Erie just north of the city limits and has 7 miles (11 km) of public beaches, wetlands, and fishing sites. Erie is laid out in a grid surrounding Perry Square in the downtown area. The downtown buildings are separated from the waterfront by the Bayfront Parkway. The tallest structure in Erie is St. Peter Cathedral at 265 feet (81 m), and the tallest building is Renaissance Centre at 198 feet (60 m). Erie has generally small ethnic neighborhoods including a Little Italy. South of 38th Street, the grid gives way to curvilinear roads of post-1970 suburban development. Millcreek Township and upper Peach Street in Summit Township include the Erie metropolitan area's newer developments. As of the 2010 United States Census, there were 101,786 people,  40,913 households, and 22,915 families residing in the city. There were 44,790 housing units at an average vacancy rate of 8 percent. Erie has long been declining in population due to the departure of factories and dependent businesses. 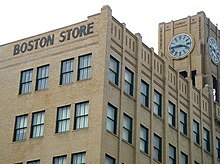 The city has lost approximately 40,000 people since the early 1960s, allowing Allentown to claim the position as Pennsylvania's third-largest city behind Philadelphia and Pittsburgh. Since the mid-1990s, the International Institute of Erie (IIE), founded in 1919, has helped with the resettlement of refugees from Bosnia, Eritrea, Ghana, Iraq, Kosovo, Liberia, Nepal, Somalia, Sudan, Russia, Syria, and Vietnam. The inclusion of refugees in Erie's community augments religious diversity and prompts community events such as cultural festivals. It is estimated that 20% of the city's population has refugee background, as of 2018. Erie has a Jewish community that is over 150 years old. Temple Anshe Hesed, a member of the Union for Reform Judaism, is served by its spiritual leader, Rabbi John L. Bush. Congregation Brith Sholom (The Jewish Center) is affiliated with the United Synagogue of Conservative Judaism, and Rabbi Leonard Lifshen has been its spiritual leader since 1989. According to the Association of Religion Data Archives,  Erie County had a total population of 280,843 people in 2000, of which 103,333 claimed affiliation with the Catholic Church, 40,301 with mainline Protestant houses of worship, and 12,980 with evangelical Protestant churches. Over 10 percent of the USA's plastics are manufactured or finished in Erie-based plastics plants. Erie is an emerging center for biofuels and environmental research, producing over 45 million U.S. gallons of biofuel a year. Tourism plays an increasingly important role in the local economy with over 4 million people visiting Presque Isle State Park and other attractions. Shoppers from Ohio, New York, and the Canadian province of Ontario frequent the Millcreek Mall and Peach Street stores and attractions as a result of Pennsylvania's tax exemption on clothing. Downtown Erie's historic and ornate Warner Theatre hosts a range of performances. Renovated in the 1980s and again in 2007,  the Warner is the hub of Erie's Civic Center. The downtown area is the home of the Erie Playhouse, one of the leading community theaters in the country, and the third oldest community theater in the U.S. . Since 2007, the annual Roar on the Shore motorcycle rally has taken place in Erie. The Erie Land Light stands at the foot of Lighthouse Street. The lighthouse was built in 1818 and replaced in 1867. Erie is served by Erie Times-News, the city's daily newspaper as well as Erie Reader, an alternative weekly newspaper. The Nielsen Company ranks Erie as 151 out of the 210 largest television market in the United States, as of the 2018−2019 report. The market is served by stations affiliated with major American networks including WICU-TV 12 (NBC), WJET-TV 24 (ABC), WFXP 66 (FOX), WSEE-TV 35 (CBS), and WSEE-DT2 35.2 ( CW). WQLN 54 is a member station of PBS and also broadcasts in London, Ontario. Cable companies available for Erie include Charter Spectrum, DirecTV, and Dish Network. Erie is also served by several AM and FM radio stations based in the city and dozens of other nearby station broadcasts can be heard. Erie Public Schools enroll 12,527 students in primary and secondary grades. The district has 23 public schools including elementary, middle, high, and one charter school. Other than public schools, the city is home to more than 40 private schools and academies. Erie city is also known for its poor ranking among public education 490 of 510 in Pennsylvania. Erie pays its teachers on average 43 percent more than the rest of the state and has soaring poverty levels in its public schools. Erie is also home of the Barber National Institute and its Elizabeth Lee Black School, which provides services and education for children and adults with mental disabilities. Erie is home to its main campus, and it provides services in Philadelphia and Pittsburgh. The Achievement Center also serves the needs of children from birth to age 21 with physical and mental health disabilities. The public libraries in Erie are part of the Erie County library system. The Raymond M. Blasco, M. D. Memorial Library, named for its benefactor, opened in 1996. It is the third largest library in Pennsylvania. 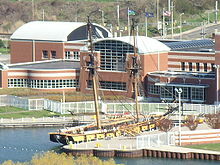 It is connected to the Erie Maritime Museum, both of which are part of a bayfront improvement project that includes the Bayfront Convention Center and the Bicentennial Tower on Dobbins Landing. The former "Water Level Route" of the New York Central Railroad travels directly through Erie. It is now the mainline for CSX freight trains. The mainline of the Norfolk Southern Railway, originally built by the Nickel Plate Railroad, also travels through Erie. At one time Norfolk Southern trains ran down the middle of 19th Street, but were removed in 2002. Passenger rail service is provided by Amtrak's Lake Shore Limited out of Union Station at 14th and State Streets. The Lake Shore Limited stops twice daily—one eastbound towards New York City or Boston, and one westbound towards Chicago. ^ Kottek, Marcus; Greiser, Jürgen; et al. (June 2006). "World Map of Köppen−Geiger Climate Classification". Meteorologische Zeitschrift. 15 (3): 261. Bibcode: 2006MetZe..15..259K. doi: 10.1127/0941-2948/2006/0130. ^ Craig, Tim (December 26, 2017). " Record-setting Christmas storm buries Pennsylvania's fourth largest city under more than 4 feet of snow". The Washington Post. ^ Fritz, Angela (December 26, 2017). " How this Pennsylvania city got more than 4 feet of snow in just 30 hours". The Washington Post. ^ "Archived copy". Archived from the original on March 26, 2015. Retrieved March 28, 2015. CS1 maint: Archived copy as title ( link). Retrieved March 28, 2015.